Two rising stars from Premiership giants Saracens have dual registered with Ampthill for the 2016/17 campaign. 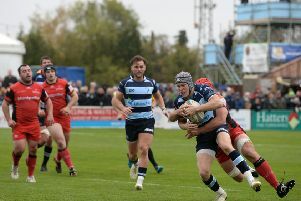 Number 8 Ben Earl and lock Nick Isiekwe are the first players this season to benefit from the arrangement which sees Saracens Academy players continue their development under the Ampthill coaching team in National League One. Amps head coach Paul Turner said: ” I am delighted that our continuing partnership with European Champions Saracens continues into its second season. “Last year Ralph Adams-Hale, Billy Walker and Max Wilkins all became valuable members of our match day squad. Earl was born in Redhill and has been capped six times for England age groups as well as captaining England U16 & Saracens U18. He was part of the Saracens 7s squad at the Premiership Rugby Sevens last season and appeared for Saracens in the Aviva ‘A’ league. Isiekwe has 12 England age group caps at U16, U17 & U18. Born in Hemel Hempstead, he played his early rugby at Old Verulamians before joining Old Albanians. Saracens Academy manager Don Barrell was delighted withthe announcement and said: “Saracens are looking forward to continuing the relationship with Ampthill. “There has been a successful partnership this year with our young players getting a great development opportunity to play in a competitive side. Turn inside for news on two more Amps signings.